Injuries to lower limbs occur frequently in traumatic collisions. Only head injuries occur more often. Severe knee and leg injuries typically require surgery, intense therapy, and a long recovery. You may need to use crutches, a walker or a wheelchair. You’ll need help to care for your home, family, and pets. While the bills are piling up, you probably won’t be able to work. How will you manage? Who pays for your injuries after a car accident? Your financial recovery depends on building a successful auto insurance claim. You need to know how to build a strong claim, avoid mistakes, and get the compensation you deserve for your injuries. This guide can help. Front-end collisions can cause severe knee, leg, ankle, and foot injuries when the car engine is shoved into the passenger compartment, forcing the dash into the legs of the driver and front passenger. Likewise, drivers and passengers riding in a vehicle that suffers a side-impact collision often sustain serious injuries to the knee. The same risk for significant leg and knee injuries applies to motorcyclists hit by vehicles. Amputations: One of the most horrific car accident injuries is traumatic amputation, where the foot or leg is severed during the collision. Amputations from vehicle collisions more often occur at the hospital, when the foot or leg is injured beyond repair and must be removed to save the patient. Fractures: Traumatic bone fractures happen in car accidents from the body’s impact with the interior of the vehicle or other solid objects. Complicated long-bone fractures and joint fractures to the hip, knee, or ankle often require Open Reduction and Internal Fixation (ORIF) surgery, meaning an operation to insert plates, pins, or rods to hold the broken bones together. Soft tissue injuries: Car accident victims often end up with bruising, sprain and strains to muscles, tendons, and ligaments in the leg, knee, or ankle. Depending on the force of impact, tendons and ligaments can pull and twist, or hyperextend well beyond their intended range. Soft tissue injuries are treated with rest and over-the-counter (OTC) pain medications, with full recovery in a matter of weeks. Knee injuries in car accidents occur due to twisting motions and blunt force trauma. Soft tissue injuries like bruising, sprains, and strains may be stiff and painful, but they generally heal in a few days or weeks without complications. 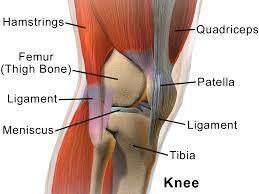 Ligament Tears: More than 70 percent of car accident knee injuries are to the anterior cruciate ligament (ACL). One of the four ligaments that give the knee flexibility, the ACL is a dense band connecting the upper and lower knee joints. As the knee turns, the ACL stretches and turns along with it. Once stretched, it usually returns to its original form. When the ACL twists too forcefully in a car accident, it can become misshapen, or worse, torn. An ACL strain can be painful, but when the force of a collision tears the ACL away from the knee joints, the pain is often excruciating and debilitating. Ligament tears often require surgery followed by a long period of rehabilitation. 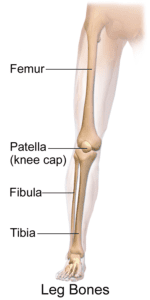 Cartilage tears: Your knee has two pads of cartilage that act as cushions between the thigh bone and shin bone. Each of these pads is called a meniscus. The impact from a car accident can tear or rupture the meniscus. A slight tear has moderate pain and discomfort. A ruptured meniscus is very painful and sometimes debilitating. Anti-inflammatory medications are used for treating a slight tear to the meniscus followed by therapy lasting several months. In more severe tears or rupturing of the meniscus, arthroscopic surgery is used to repair the meniscus and remove torn tissue debris. Repair surgery is called a partial meniscectomy. When the meniscus is beyond repair, the surgeon removes the damaged meniscus and replaces it with an artificial cushion. Replacing the ruined meniscus is called a total meniscectomy. Recovering from a partial or total meniscectomy can take six to nine months of medical treatment and physical therapy. Dislocations: Knee dislocations can happen in high-speed collisions. A dislocated knee is a complex injury that often involves ligament and blood vessel damage. If arteries are blocked, the loss of blood flow may lead to amputation. Fractures: Knees are subject to injury in any car accident. However, head-on collisions commonly cause fractures to the patella, also called the kneecap, from violent impact with the dashboard. Simple fractures or displacement of the kneecap can be immobilized with a cast for six or eight weeks. More complicated kneecap fractures require surgery to put the bones, muscles, and ligaments back in place. Knee fractures often lead to arthritis in the future. Some car accident injuries to your lower limbs will be obvious at the scene, such as mutilating trauma, or compound fractures where a broken leg bone is protruding through the skin. Other injuries may not be immediately apparent right after the crash. Shock and distress from the crash can mask pain and weakness. Some symptoms develop in the hours and days after the crash. Discoloration: Infections can cause redness or yellowing. Excessive bleeding into a joint or under the skin may be black and blue. Temperature changes: Some warmth to a healing area is normal, but when the knee or ankle joint becomes hot and swollen, it’s not a good sign. If one leg, especially the lower leg, becomes much cooler than the other, you may have a blood clot interfering with circulation. Reduced movement: If your knee or leg is weakened, or you can no longer bend or move your knee or ankle, you may have serious joint injuries. Pain: Some discomfort is normal after a car accident, but if your knee hurts when you move or touch it, you may have more than soft-tissue injuries. Accidents happen without warning, but you don’t have to be a helpless victim. When a leg or knee injury from a car accident has you sidelined, you deserve compensation. If you live in a no-fault insurance state, you must file a claim under your own insurance policy’s personal injury protection (PIP) coverage. PIP pays for your medical bills, out-of-pocket expenses, and lost wages. PIP does not pay for pain and suffering and may not be enough coverage for severe injuries. When no-fault laws don’t limit you, or your injury costs are more than your PIP, seek compensation from the driver who caused the accident. Start by filing an injury claim with the at-fault driver’s insurance company. You can ask for the other driver’s insurance to pay the medical costs for your leg and knee injuries, out-of-pocket expenses, lost wages, the cost of hired help, and for your pain and suffering. Filing an insurance claim is easy. Getting the insurance company to pay a fair settlement amount is an altogether different matter. To get the compensation you deserve, you’ll need evidence. Don’t feel up to dealing with insurance companies? Talk to an experienced personal injury attorney . Your attorney can file your claim and handle the insurance adjuster, so you don’t have to. No-fault insurance pays no matter who was at fault, but you’ll have to prove you were injured in a crash, and the extent of your injuries. The other driver’s insurance company won’t part with a nickel until you prove their insured is responsible for the accident and prove the extent of your injuries. You’ll prove your claim with evidence you collect, starting right after the accident. Damages can include property damages to your car, and personal injury damages like medical and therapy costs for your knee or leg injuries, out-of-pocket expenses, lost wages, and pain and suffering. Direct and Proximate Cause is an action that leads to damages which wouldn’t have otherwise happened. You wouldn’t be suffering through a knee replacement if you hadn’t been hit head-on by a drunk driver. To have a strong knee injury claim, gather evidence to show the other driver’s actions were negligent, and their negligence was the direct and proximate cause of your injuries. When help arrives, don’t try to put on a brave front. Tell the paramedics about your knee pain, if your foot is numb, or any other symptoms you are feeling. Let the paramedics immobilize your legs. If they want to transport you to the hospital, let them take you. Never refuse or delay medical treatment after an auto accident. The insurance company won’t hesitate to deny your claim, arguing that your injuries weren’t caused by the collision. If you aren’t taken directly to the hospital from the scene, see your physician or go to the nearest emergency room or urgent care center as soon as possible. Tell any medical providers who treat you that your injury is from a car accident. It’s crucial for the records to reflect that your injuries are directly related to the collision. When you’ve just suffered a knee injury or trauma to any other parts of your legs or feet, you probably won’t be able to move around to gather evidence. Don’t make your injury worse by trying. Aggravating your injury can also hurt your claim. Photographs: Using a smartphone camera or another device, take photographs and video of the scene from different angles. Take pictures of skid marks and damaged road signs or trees. Look for beer bottles or other open alcohol containers in and around the other driver’s car. You can never have too many photos. Witness statements: Try to talk to anyone who may have witnessed the accident and its aftermath. Ask the witness for their contact information and if they’ll write down what they saw. Witness statements can be compelling evidence of fault, especially if the witness says the other driver was doing something wrong, like texting, or heard the other driver admit fault. Notes and communication records: After the crash, make detailed notes of everything you remember before the accident and as the crash happened. Describe your fear and pain after the impact, and your experience with emergency responders. Keep a journal during your recovery with details of your pain, mobility issues, frustrations, sleep issues, and worries. Also, keep copies of any communications you’ve had with the insurance company. Medical records: You’ll need to collect copies of all your medical bills and records. Your medical documentation will help link your injuries to the accident. Request records from the emergency room, your treating physician, and any specialists or therapists you’ve seen because of the accident. Include mental health records if they relate to anxiety or trauma from the crash. Police report: Police reports are some of the best evidence you can have. Insurance adjusters see the police as impartial and objective investigators. The police report will include a diagram of the crash, weather conditions, citations issued, DUI tests and results, and will have the officer’s opinion of fault for the accident. You can usually pick up a copy of the police report shortly after the accident for a nominal fee. If you’ve fully recovered from soft-tissue leg or knee injuries, you can probably negotiate a decent insurance settlement without an attorney. Your compensation amount should be the total of your medical bills, out-of-pocket expenses, and a few weeks of lost wages. If you aren’t filing a no-fault claim, you can add one or two times that amount for pain and suffering. When you’ve suffered severe leg or knee injuries, especially when those injuries are disabling, you can’t get a fair amount of compensation without a skilled attorney. Insurance companies typically offer lower settlements to badly injured claimants who don’t have an attorney. When the adjuster says, “Take it or leave it” they know you probably don’t have the energy or legal skill to fight back. Don’t take a chance with your financial future. It costs you nothing to find out what a good personal injury attorney can do for you. How much for a knee injury in an auto accident?